Residents all over housing are getting into the spirit of Halloween, including this room found in Biscayne. Imagine waking up November 1 only to realize that you didn’t attend ANY Halloween events—frightening! Don’t worry, though: We’ve compiled this easy list of housing events that will help you get into the spooky spirit. It’s time to face your fears. Join us at Eagles’ Landing for a night of food, games, and fortune telling! Don’t want the night to end yet? We will also have a bonfire by the lake and the ultimate cook-off! RHA’s 7th annual Harvest Party will be the best one yet. Children from the community will trick-or-treat in South Village, going door-to-door to receive candy from residents who’ve volunteered to participate! It will be a night of crafts, games, food, and—of course—candy! The children will have fun making their own treat bags and housing residents will have the chance to celebrate Halloween with young members of their community. Come play with us in West Lake! Nightmare on Our Street will feature the return of the popular haunted maze as well as free pizza and candy. Oh, and don’t forget to wear your best costume for the chance to win our costume contest! It’s all happening in the WLV Community Center. It’ll be a night to remember… just don’t fall asleep! Join us on the SoVi Green for a spooky night of fun and games! There will be something for everyone, including laser tag, rodeo pumpkin, a photo booth, relays and a live DJ. Plus, don’t miss the chance to win a free prize and eat some festive food, including turkey legs and caramel apples! This event is sponsored by RHA Area Councils and the Office of Housing & Residence Life. For more information on the events, visit our Facebook page and keep an eye out for fliers in your area. Happy Halloween! It’s almost time to choose a room for next year, returning students! Do I want to live in North Lake Village (NLV), West Lake Village (WLV) or South Village (SoVi)? Note that this is the first time SoVi (Osprey Hall only) has been an option for returning residents. Only current SoVi residents are eligible to select a SoVi room. If you don’t currently live in SoVi but want to participate in Returning Student Sign-Up, then your options are limited to NLV and WLV. You can only apply for one area. Do I want to stay in my current room next year? If you already live in WLV or NLV, you can choose to stay in your current room unless you live in building S, T, or apartments 13-24 in Oak. These areas are reserved for special housing next year. If you currently live in SoVi, you must select a new room. However, if you currently live in Osprey Hall on the 6th, 5th, or 4th floor (poolside), you have the option to squat. The remaining areas in SoVi are reserved for first-time students only. If you decide not to stay in your current room, have a list of potential rom locations that you want to select. That way, you won’t be too overwhelmed if your first choice isn’t available. Do I know who my roommates will be? Decide on your intended roommates. Be sure that you all have the same type of agreement (WLV or NLV/SoVi). You must have the same type of agreement in order to be placed together as roommates. If you plan on pulling in roommates, create and share your screen names now. You can create a screen name if you go to the housing portal under “Returning Student Sign-Up” and “screen name”. You will need each roommate’s screen name and UIN. Once you’ve decided which housing area you’d like to apply for, you need to log into the housing portal to re-apply between February 17-26 to indicate your preference. If you do not update your application in the portal during this time, you will need to apply in the regular housing process and pay the $50 application fee. The next step will be to select a particular room. This will be done completely online, unless you want to live in the Wellness Community (in which case you must come to the Central Housing Office to sign up from March 24-28). (A) If you are applying for WLV, you will receive a lottery number on Friday, February 28. This number will decide when you are allowed to choose a room. If you want to stay in your same apartment and room in WLV, you will be able to do so March 10-12. Those residents will then be able to pull-in roommates they mutually agree to live with on March 13-14. The lottery will then open on March 17—this means that if you do not decide to stay in your current room, you’ll be able to select any open WLV room, beginning with the first lottery number and going up. The last day to select an open WLV room is March 19. If there are more applicants than rooms available for WLV, students who do not get a room will have their applications changed to NLV and will be assigned a lottery number for the selection in that area. If you would like to be placed on the WLV waiting list, you will need to contact the main housing office via email at housing@fgcu.edu. (Note: if you are on the waiting list, you do not need to sign up for NLV; an application will be created for you). (B) If you are applying for NLV, you will receive a lottery number on Friday, March 21. The process for room selection will be the same as in WLV. Students who wish to stay in the same apartment and same room will pick March 24-26 and will then be able to pull-in roommates March 27-28. General room selection will begin with the first lottery number on March 31 and run through April 3. Any student who does not choose the same room or a new room by Friday, April 4 will have their housing agreement canceled. Students may cancel their housing agreements for any reason without penalty as long as they do so by 11:59pm on Friday, April 11. Cancellations must be for approved reasons and will incur a penalty following this date. All assignment letters will be sent to students via their FGCU email on April 4. There are two Special Interest Housing communities: Wellness and Honors. If you are interested in Honors, you can squat or choose a room in Honors online. However, if you are interested in the Wellness Community, you will not be able to select your room online. You will need to come in to the main housing office, located on the 2nd floor of the Commons Building within North Lake Village, to sign up for a space in Wellness from March 24-28. You may only pull-in roommates who mutually agree to live with you and have applied for your same housing area. There is no roommate preference online prior to roommate pull-in, so those wanting to live together will not have identical lottery numbers. The resident with the lowest lottery number may pull-in a resident with any lottery number. You will need to know their Housing Portal screen name and UIN. You may not select your same room if it is in SoVi (except floors 6, 5 & 4 poolside) or buildings S, T or apartments 13-24 in Oak in NLV. West Lake Village agreements are for Fall, Spring and Summer. North Lake Village & South Village agreements are for Fall and Spring. When you update your application Feb 17-26, you are agreeing to the terms and conditions of that housing area. For more information on the Returning Student Sign-Up process, visit our website. Love your room and want to show it off? Is it the cleanest room on the floor? The one with the most school spirit? The purple-iest? Does your room just rock? Enter the My Room Rocks room design contest today! All you have to do is fill out our entry form and agree to abide by the contest rules and terms. It’s as simple as that! Remember: Entries must not violate Res Life policies. Check out the Community Guide for more info. Vote for your favorite room on our Facebook page from Monday, October 21-Friday, October 25. Vote for as many as you’d like! Note: You do not need a Facebook account to enter the contest, but you will need one to vote. Get creative with your photography. Find out which view of your room is the most effective by playing with angles. Don’t spend too much money on decorations for your room. We want to see what you can do with the budget that works for you. Find ways to come up with creative solutions for storage and lighting. The large white tent stood in place. Staff members were excited and a steel drum played tunes as the Kona Ice truck sat awaiting its first taste-testers. And the wind—well, the wind was its own special guest. Despite the breezy weather, attendees of the Oct. 26th Osprey Hall Open House were not phased. The event began as guests were greeted by smiling Housing & Residence Life staff members, who donned green shirts for the occasion. Vice President for Student Affairs Dr. J. Michael Rollo provided opening comments to guests, commenting on how much the Housing operation has grown in just a few short years. FGCU President Dr. Wilson G. Bradshaw followed, speaking on how the residential program is about more than simply providing beds for students. In fact, the program provides support and aims to help students learn both in and outside the classroom. First Year Residence Experience (FYRE) Fellow David Green also spoke, noting his unique opportunity to be available to and interact with students for extended hours. Osprey Hall RHA Area Council President Paige Oswald offered a different perspective as she relayed her enthusiasm about being a part of the first class of students to live in the residence hall. Dr. Rollo then offered some closing remarks. After the presentation, guests enjoyed tours of the residence hall. Certainly they were impressed with its many features: Osprey Hall’s 533 residents have access to a community kitchen, study rooms, an arcade game room, a video game room and a movie theater (to name a few of the community resources). But the tours did not just include common areas of the building; guests also got to view the living areas of a few residents. This allowed attendees to get a better idea of what living in Osprey might actually be like. After all, seeing a decorated and lived-in area does more for the imagination than an empty space might. Osprey Hall is accurately named; Just as the bird of the same name seeks a home with ample food and a nearby body of water, Osprey sits close to SoVi Dining and will soon overlook a community pool. The hall also participates in the First Year Residence Experience (FYRE) program, a program that is designed to transition students from home to college. In all, the sense of comfort and community that Osprey creates is what makes the residence hall such an integral addition to South Village. It was the appropriate event to kick off what is destined to become one of the most desired residences on campus. With its many amenities and excited first-year students, Osprey Hall is bound to remain popular in the years to come. *Click the photo above to see more photos from the event. It’s that time of year again! Somehow the fall semester always seems to fly by, and we’re already talking about Thanksgiving again. 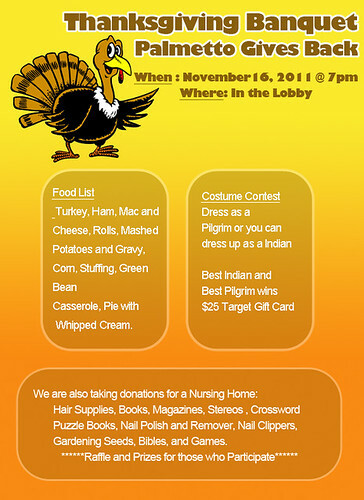 There are a few events going on in and around Housing for Thanksgiving this year, so today we’ve got a round-up of all the fun for you. The Palmetto Hall Area Council invites the residents of Palmetto Hall to join them for a full Thanksgiving feast, complete with ham, turkey, green bean casserole, mashed potatoes, stuffing, pie and more. Residents are encouraged to bring supplies to give back to a nursing home in the Fort Myers community. The Area Council will be collecting hair supplies, books, magazines, stereos, crossword puzzle books, nail polish & remover, nail clippers, gardening seeds, Bibles and games to enhance the nursing home’s residents’ lives. Participants who bring a donation will be entered to win raffle prizes. Palmetto residents are also encouraged to come in costume as a pilgrim or Indian, and the best of each costume will win a $25 Target gift card. Eagle Dining is hosting a Thanksgiving feast in SoVi Dining during lunch hours. Join them for an herb roasted turkey, stuffing, green beans, pumpkin pie and pecan pie. 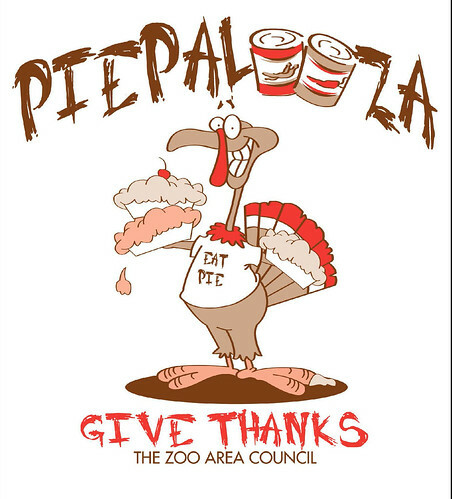 The North Lake Village Zoo Area Council invites residents of their area to the big Piepalooza. There will, of course, be lots of pie. There will also be free long-sleeve t-shirts to commemorate the event. Residents are encouraged to bring canned food for the canned food drive to give back to the Fort Myers community. In addition to these great events, we have important information for the holiday week for our residents. There are no classes on Wednesday, Thursday, Friday or Saturday, Nov. 23-26. All residence halls will remain open to residents throughout the break. The Office of Housing & Residence Life will be closed in observance of the holiday at 1pm on Wednesday, Nov. 23 and on Thursday, Nov. 24 and Friday, Nov. 25. Residents will still be able to submit maintenance requests through the housing portal, but non-emergency requests will be completed when we return to regular working hours. SoVi Dining will reopen for regular hours on Sunday, November 27. For more information on Eagle Dining, please visit their website.